The CJTZ is a concealed connector. It can be installed three ways: with no routing of header/post or beam, a routed header/post or a routed beam. It is part of a concealed connector system that includes the CPTZ and CBTZ. The CJTZ is supplied with all dowels and screws required. Screws require a hex-head driver. Router end of beam for screw heads for flush installation. The carried member may be sloped up or down to 45° with full table loads. This connector requires special attention to ensure correct installation. The beam must be installed perpendicular to the support member. The connection's components may be damaged if the beam is rotated from its opposite end during or after installation. Damaged components may not be noticeable and may reduce the connector's load carrying capacity. See technical bulletin CJTZ/HCJTZ — Concealed Joist Tie Kits (T-C-CJTZ). The CJTZ only is available with two dowel lengths. To order: specify short (e.g. CJT3ZS) or long dowels (e.g. CJT3ZL). Short dowel (1/2" x 2 3/4") for use with 3 1/8" glulam beam, 4x sawn lumber or 3 1/2"-wide PSL. Long dowel (1/2" x 4 3/4") for use with 5 1/8" glulam beam, 6x sawn lumber or greater widths. Center dowel in beam. 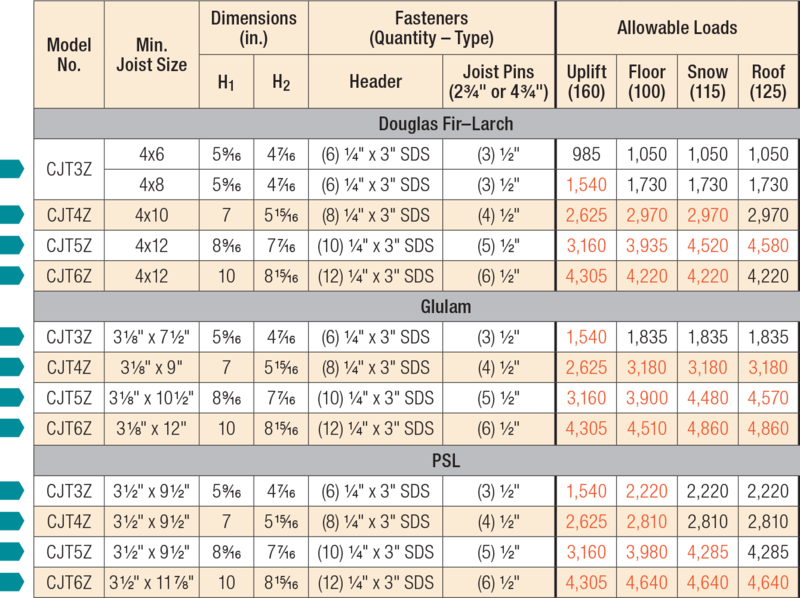 Short dowel (1/2" x 2 3/4") is for use with 3 1/8" glulam beam, 4x sawn lumber, or 3 1/2" wide PSL. Long dowel (1/2" x 4 3/4") is for use with 5 1/8" glulam beam, 6x sawn lumber, or greater widths.